If ever a project epitomised the ethos of Thomas Robinsons Architects it would be this magnificent four-bedroom home built on a stunning village-edge site. With a brief to optimise natural sunlight and space, this environmentally-friendly property has delivered on every requirement of the brief. Located in a sensitive semi-rural location which offers views to the Campsies, the aim was to push the building's north eastern side as close to the boundary as possible to give most space to the south-western side. This enabled the clients to benefit from maximum sunlight and enjoy the best views. Natural daylight tracks the main spaces throughout the day, starting in the master bedroom, through the kitchen and into the living area in the evening. From the kitchen and hall spaces there is feeling of being in the garden, being right in amongst the landscape and having a constant connection with the moor. Challenged with creating large open spaces, Thomas Robinson Architects designed one big barn-like room featuring huge oak beams, a lower area for the kitchen and large double-volume eating and living section. Natural materials are used throughout and a high level of detailing has ensured a magnificent finished look. 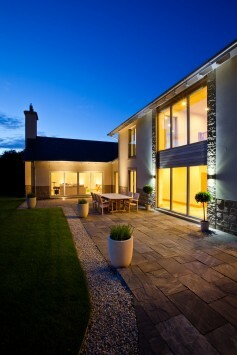 External details are crisp and contemporary with natural stone, render and slate features. As to be expected, energy efficiency is high priority with low-energy lighting and an air tightness result of 2.29m3/hxm2.